How do SSL Certificates work and what are my options? First, check and see if your answer is in the article - odds are, it is! Otherwise, search here for answers, submit ticket, or call us at 1-800-936-9006. Keep reading for the most common aspects of getting started with your AmeriCommerce online stores . Happy building and good luck on your new store! For 14 days, it's all yours to try, tweak and test. Do anything in your store from design, to configuration, to product listings and more. Jump in and add your products, and all the details you like - it all counts as you setup your store for launch and you'll keep your work when you upgrade to your regular subscription. Why Your Favorite Password Doesn't Work. A quick note about security and passwords. Your AmeriCommerce online stores trial consists of two critical areas; your storefront and your admin console. Your admin console is the doorway into your online store and it's got laser beams! Well, not really, but close. It's got security for sure. So. you need a solid password to access it. Like a super strength password, the kind you might normally forget. We have super strength security measures in place for an air-tight seal on data. As a result, and for your absolute protection, we have a pretty tough password setting. And that's a good thing! If you are looking for a general understanding of the features, you're best starting point is to look through the features section of AmeriCommerce online stores and then locate them in the admin. "Just The Highlights" [NEW GUIDE Coming Soon] If you are not sure where to start with your trial, you might find this guide helpful. It's not so much a step through of settings, but more an overview of the software section by section within the admin console. Think of it like a handshake where you can get familiar with the software. Power users, specific use-cases, and tutorials continue below. Your storefront consists of: Homepage, content pages, blog pages, product pages, category pages, shopping cart, checkout page, widgets, and all that is displayed within your theme. This is what your visitors and shoppers experience when visiting your website. Your storefront link looks something like "store1234.americommerce.com" in your confirmation email. You can rename this to anything you like once you upgrade from a free trial to a paid subscription. Your admin console is where all your settings, configurations and store building tools are located. You'll use the admin console to create your site design, setup all your products and store settings such as accepting payments and setting up shipping as well as your customer and order management, product entry and more. You can access your admin console by click from your confirmation email. It looks something like "1234.americommerce.com/store/admin"
Choose a theme or build your own. AmeriCommerce online stores use a template theme system. Select from any of the free themes, or build your own - or customize one of the free themes to become your own. First impressions of the look, feel and message of your homepage are very important. You should have a professional site design, easy to use navigation, and clear benefits to your visitor. It's not uncommon to feature best sellers, popular products, your product categories and calls to action on your homepage. For more on the basics of web design, best practices and what to consider when designing your homepage for ecommerce, go to the Web Design Guide. Each of your products are on a product page. These pages include the product name, description, price, item number and various details related to your product. Your product page can be customized in how it looks, if it shows a retail price and a marked down price, if it has reviews, custom descriptions, and even related products. Product pages also include pages with product lists, category pages, product search pages, manufacturer pages, and product detail pages. Your customers use the checkout pages to manage their cart, view orders and make purchases. From these pages they can add/remove/edit products in their cart, enter new personal account information and shipping information. Checkout pages include: the shopping cart, one page checkout, checkout wizard, order details and receipt pages. Your customers use the account pages to manage their personal information including names, email addresses, physical addresses and password. Account pages include My Account, Lost Password and Change Password pages. These pages are experienced much the same way as content pages but also include reader comments, blogging widgets, blogging categories and tags, as well as rss feed services. If you are using the AmeriCommerce online stores mobile theme, your visitors on a mobile device will experience all the same pages of your site, but in a mobile friendly format. You are free to create your own mobile friendly experience by creating your own theme. Your admin console is where all your store management capabilities and store settings are located. This is your command center to do everything with your ecommerce store from website design to site usage analysis to catalog and product management. 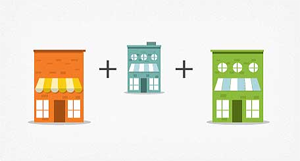 Why Your Store Admin also Supports Multiple Storefronts. Multiple storefronts allows you to re-brand your products or even offer a separate set of products on different websites, but manage it all from the same administrative console. AmeriCommerce online stores tightly integrate multiple storefronts within the admin for both single stores and multiple storefronts. So, even if you only have one store, you'll still have admin options for multiple storefronts. We do this so you can easily grow into owning, operating, and running multiple stores in the same admin environment. As a result, your store-Level settings can be found under the "Stores" menu in the administrative console. Get more help on multiple store setup. Through the store settings you can setup payment options, shipping, handling options, tax rates, active product catalog and other store-level options. Use the global settings options to address setting that go across all your stores such as discounts, payment gateways,drop shippers and warehouses and your import export tools. Your storefront pages are all managed within the AmeriCommerce online store theme system. This theme system is flexible and powerful and allows you to have custom designed homepage, content pages, product pages, and more. You can use the theme editor to make changes to the default theme or to create your own theme layouts using custom html and css. You can assign each theme to any of your multiple stores. The template system allows you to specify duplicate content across all pages. Duplicate content usually includes things like logo, navigation, footer, and common functionality you want on all pages like a newsletter signup or a promoted product. Templates have defined areas such as page header, page footer, left column, right column and center content. You can modify the theme templates or you can use the content management features to pull in your own completely custom pages outside of the theme system. You use the theme system to assign merge codes and widgets to pages and bring new capabilities in that template or a specific page. The theme system has many pages you can modify such as category pages, manufacturer pages, search pages, product detail pages, shopping cart page, checkout pages, blog pages, content pages, and more. Widgets allow you to bring new functionality to the page. In the theme manager, every page type has a widgets section you can add to widget areas. Available widgets include image/logo, search box, slideshow, custom html, product display, and much more. Merge codes are tags that can be placed in emails or in certain content areas that allow dynamic information to be added to a page. Some merges are based on data elements while others are related to various website functions. For example, in the site's header, you can include the ##LOGINLOGOUTLINK## merge to create link that will take you to the login page when a user has not logged-in and will change in to a log-out link after logging-in. Your content pages and blogs are all accessible through the content area of the admin. This is where you can make all your pages and blog posts as well as create your navigation links for your content pages and the blog roll and blog posts. Your catalog will include all the information about your products including descriptions, categorizations, pricing, product images, and much more. product mass editor and imports. The Product Editor allows you to see and edit all information about a given product. The Quick Product Entry allows you to add a new product with just the basic information needed. The Product Mass Editor allows you to update similar information about several products at the same time. You can use embed code and links to list products, carts, and login information on any website - beyond your AmeriCommerce online store. Embedded ecommerce is popular for selling from a blog or another CMS site and social networks. Use the various Import Tools to easily manipulate a large number of products in a spreadsheet or other external application, and update the catalog in a few easy steps. For existing items you already have in the AmeriCommerce online stores , you can use the Export Tools to first export your data. Once you have it exported, you can make your changes, add new items if you like and then import the data. The format for the exports is pretty much the same as the imports. This allows you to more easily maintain your information. If this is the first time you are importing your items, you can download a blank template that includes all the headers. There is a link on the first page of each import. If you already have a file from possibly another system, you will need to first convert it to a CSV (comma separated values) file. You can do this either with a program such as Microsoft Excel or manually by hand. Once in the CSV format, you can use the Import Tool to map your column header names to our column header names. When a column header name in the file matches one in our list, it will automatically try to map it. If you plan to map from a given format several times, you can save a mapping file that can be referenced later. You can track and maintain the quantity of each product or product variation you have in stock. Stock quantities can automatically be decremented based on one of several order triggers. Triggers include Ordered, Paid and Shipped. You will also want to maintain the product status for your items. Common product statuses include In Stock, Out of Stock, Back Ordered and Discontinued. You can customize this list to meet your needs. You can also configure each product status to have your store manipulate the handling of the product such as hiding it or making it unavailable to be added to the cart. The product statuses can be maintained on the Product Statuses page. There are several ways to maintain the stock quantity and product status for your items. You can use the product details to maintain them individually, or you can use the Inventory Editor or Imports to do it in mass. You can review your orders, print invoices and packing slips, process payments, enter manual orders and handle drop shipping. Order processing includes the Order Manager, Order Edit, Order Statuses Configuration and Drop Ship Manager pages. The Order Manager page displays a list of your orders. You can filter the list by store, customer, status and several other criteria. You can perform operations on multiple orders at once such as printing invoices and packing slips, send email notifications and status changes. You use the Order Edit screen to modify existing orders and to add new orders. You can also process payments and credits from this page. The Order Statuses configuration page is for setting up the status you would like to use for processing your orders. Statuses are highly configurable and allow you great flexibility by allowing you to process orders in a way that make sense for you business. On this page, you can set the way statuses are reflected during credit card transactions, set automatic email notifications and more. The Drop Ship Manager lists all of the orders for a particular drop shipper (or warehouse). The orders listed here will only include those orders which have an item that is associated to the current drop shipper, which can be chosen from the drop down box. In many respects, this page is similar to the order manager. At this time, drop shipping allows e-mails to automatically be sent to the associated drop shippers when an order is placed and/or paid for, and includes relevant items. The e-mail notifications and drop shippers themselves can be configured in the Drop Shippers/Warehouse section of the administration console. There are two options for providing a list of shipping options to your customers. The first is to use a list of shipping methods and live rates provide by major shipping providers. You can pick one or more shipping providers and even pick the methods you want to provide to your customers. Included are advanced options for mark ups and disabling method per store. All you do is provide the weight for each item and maximum weight for each package. When the customer enters their address and request a shipping quote for an order, the shipping engine will estimate the number of packages including weight for each, send this information to each shipping provider and display a list of live rates to the customer for each method available in their area. You can also select various advanced features at the store and product level such as "ships separately" or "non-shipping item". AmeriCommerce online stores support live rates for several of the major shipping companies. The second option for providing methods and rates to your customer is to use custom shipping methods. Custom shipping methods are for those who want more control over the rates provided and charged to customers or who are not necessary using one of the supported shipping companies. Each custom shipping method is entered with a set of rules for determining the rate. Rules can be based on weight, purchase price, number of items, shipping region and warehouse. Rates can be based on one of several criteria including flat, percentage and number of packages. Many of the advanced store and product level features also apply to custom shipping methods. AmeriCommerce online stores have a wealth of reports that are available to you with most including easy-to-read graphs. From management to marketing and ecommerce to visitor analysis, there are reports to help you analyze all aspects of your online business. There are several summary reports to give you a big picture view. As an example, the Dashboard Summary provides the following information. Marketing Reports can help you analyze your various campaigns to determine which ones are providing you the best returns. Some of the reports offered are Pay Per Click Analysis, Organic Analysis and Ad Code Analysis. The ecommerce reports provide you with information on sales, taxes, shipping and other information related to purchases. The sales report here gives you a break down of sales by category and product. Visitor reports provide you with different views of how your customers or potential customers use your site. Some of the reports available include Most Popular Pages, Top Entry pages, Top Exit Pages and Top Referrers. AmeriCommerce online stores provide you with several built-in marketing tools to help you increase your site traffic and sales. There is integration with Google AdWords and Yahoo Pay Per Click to help direct targeted traffic from those popular search engines and report on your investment. We integrate directly with Google, Yahoo and ShopZilla shopping portals to allow you to upload your products to their sites. We also have the ability for you to provide electronic affiliate links to your partners and track the related sales activity through the affiliate console. Additionally there are built in facilities for automatic sitemaps, dynamic custom URL's, page titles and meta tags. Also, mass emailing management, chatting software integration, email templates for marketing, adcode visitor tracking and much more. File management can be an important part of maintaining your website. Depending on your needs, it is something you may do weekly or even daily. However for some customer who have small catalogs and use a designer for their website, they may not need to deal with files at all. Coming up with an effective means for handling your files can mean increased productivity. While evaluating your needs, you will need to consider the type of files you will be working with, where those files are located and the tool(s) you will use to manage them. Use the following links to get familiar with the common setup steps and preparing for launching your store. Learn more about specific steps and instructions to setup your AmeriCommerce online store. These are just a small collection of our 100+ articles. If you do not find what you are looking for here, do a keyword search or submit a support ticket or give us a call! For more help and instructions, see 100's more helpful tutorials and explanations in our knowledge center!